Here is something for the little ones in your life, Band Angels! 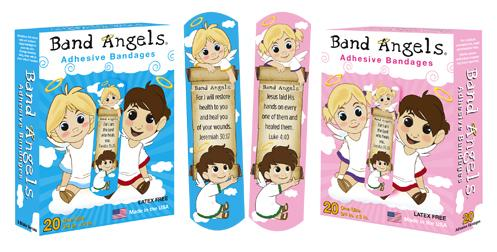 Band Angels are bandages with healing bible verses printed on them. They also have adorable angel characters that little ones love. I know this because a while back we were sent samples to review on my personal blog and my daughter Penelope loved them. Any little scratch, bump, or poke, she was trying to convince me that she needed a Band Angel to make her feel better. She loved hearing what was written on each one and I loved the fact that I was sharing scripture with her in such an endearing way. When we were sent Band Angels for review they only came in blue but now you can get your Band Angels in pink! Wait until Penelope finds out. These bandages are latex free and made in the USA, we love them, and so will you! Band Angels can be purchased online or in a few retail shops. Be sure to like Band Angels on Facebook for all the latest information on these precious bandages. The people at Band Angels would like to bless two of our Girly Girls with 2 boxes of Band Angels each, blue and pink. To Enter: Leave me a comment telling me what your favorite Bible verse is. You can get extra entries for following GGG through GFC, Subscribing via email, liking us on Facebook and following via Twitter. This giveaway will end on May 26, 2013. I will choose the winners using Random.org. Please leave a valid email address if it is not visible in your profile. US entries only. I am Subscribing via email. We might not always understand why things are going on, but God does and he will use it for His good if we are His children. Psalm 126:5-6 Those who sow with tears will reap with songs of joy. Those who go out weeping,carrying seed to sow, will return with songs of joy, carrying sheaves with them. follow via twitter as th7272. thanks!